More Republican voters are worried about climate change after massive hurricanes pummeled states including Texas, Florida and Louisiana — all of which have GOP-heavy congressional delegations. Fifty-seven percent of GOP registered voters said they were concerned about climate change and its impact on the environment, up 7 percentage points from April, according to a Morning Consult/POLITICO survey conducted Sept. 7 through Sept. 11 — just as Hurricane Irma was sweeping through the Caribbean and Florida. “I’m not surprised at all [about the growing Republican concern],” Rep. Carlos Curbelo (R-Fla.) told reporters Wednesday. Curbelo and fellow Florida Rep. Ted Deutch (D) co-chair the Climate Solutions Caucus, a bipartisan group of House lawmakers devoted to seeking policy options to address the risks and causes of climate change. Overall, 67 percent of the 1,976 registered voters polled said they were concerned about climate change and its environmental impact, in line with figures from the spring. Concern among Democrats and independents has dipped 7 percentage points and 4 percentage points, respectively, since April. The new poll has a margin of error of plus or minus 2 percentage points. When asked about the contribution of climate change to recent natural disasters, such as the hurricanes that impacted parts of Texas and Louisiana, 61 percent of voters — including 52 percent of GOP voters — said the changing climate had at least some impact, while 21 percent believed it had little or no impact; another 18 percent of voters did not know or had no opinion. Republican voters’ views may put them at odds with the Trump administration, which has avoided linking the natural disasters to climate change in recent statements and press appearances. Speaking to reporters on Air Force One after his visit to Florida on Thursday, President Donald Trump didn’t answer a question about his views on climate change, saying instead that the severity of recent storms had not made him reconsider his opinions. “We’ve had bigger storms than this,” he said, according to a press pool report. Trump and Vice President Mike Pence spoke in Fort Myers, Fla., earlier on Thursday, commenting on the relief efforts in the wake of Hurricane Irma. Neither mentioned climate change or the causes of the recent natural disasters. 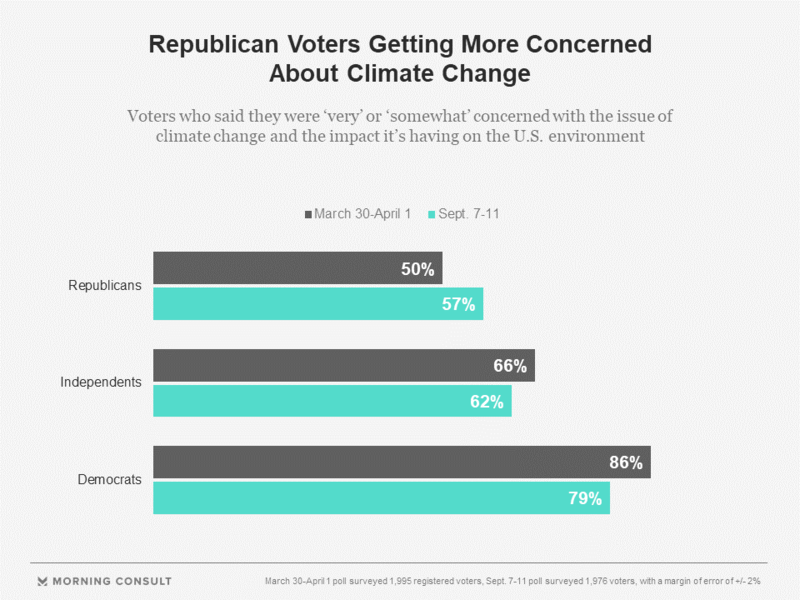 Thirty-nine percent of Republican voters say they’re not concerned or not too concerned about climate change — at least 15 percentage points higher than levels among independent and Democratic respondents, according to this month’s poll. When asked about those figures, conservatives who support action on climate change point to the polarizing political choices the issue can create, as well as the increased development of disaster recovery capabilities. “Folks have political dogmas that they’re attached to and they’re not going to give those up in the face of evidence,” said Dale Ross, Republican mayor of Georgetown, Texas, in a phone interview Tuesday. His city began running on 100 percent renewable energy in March. While Ross considers climate change to be central to the growing frequency and size of the most recent hurricanes, he noted that some may have to conquer ideological hurdles to accept that connection. Fifty-two percent of registered voters in the recent poll believe that climate change is making natural disasters more frequent, and the same percentage said climate change is making those disasters more powerful. Twenty-five percent disagreed with each statement. Republicans were the only partisan group closely split on the issue of frequency, with 40 percent saying they believe climate change makes natural disasters more frequent and 41 percent disagreeing. Geography also appears to be playing a role in driving public sentiment toward a more hawkish view on the subject in the wake of Hurricanes Harvey and Irma. Forty-one percent of respondents who reside in the South said they were very concerned about climate change’s impact on the U.S. environment, up 8 percentage points from the spring survey. While climate change is a polarizing topic, there is greater agreement on clean energy, according to Charles Hernick, policy and advocacy director at the conservative-leaning advocacy group Citizens for Responsible Energy Solutions. Hernick said that drawing direct links to climate change is difficult because natural disasters are one-off occurrences that are difficult to compare. In addition, he said, the United States has adapted its infrastructure and disaster preparedness to weather these disasters much better than other parts of the world. “We’re going to lose millions of dollars, but fortunately we’re not going to lose thousands of lives,” Hernick said, noting that thousands have died in South Asia as a result of recent monsoons. This story has been updated to reference Trump and Pence’s visit to Florida on Thursday and Trump’s remarks to reporters .